Yay!! It’s Friday and the weekend is here – this week was so busy I didn’t even have time to think about what day it was. Phew! Today I’m sharing a super easy weekend look that I put together for brunch with my bestie last weekend. With the weather still playing nice here in Chicago, I decided to go no tights again – honestly, I truly feel that the “tight” rule only applies to temperature, not date. Right? Can we agree on that? Ok, moving on…. So secret…this skirt, is actually a dress. It’s a dress I bought during one of my work trips to the UK at a store called Whistles – it’s a super chic UK brand that you will instantly fall in love with. So this dress, I love it – I bought it almost three falls ago and it’s still a timeless piece. Since I’ve had this dress for a few years, I’m always looking for new ways to style it. 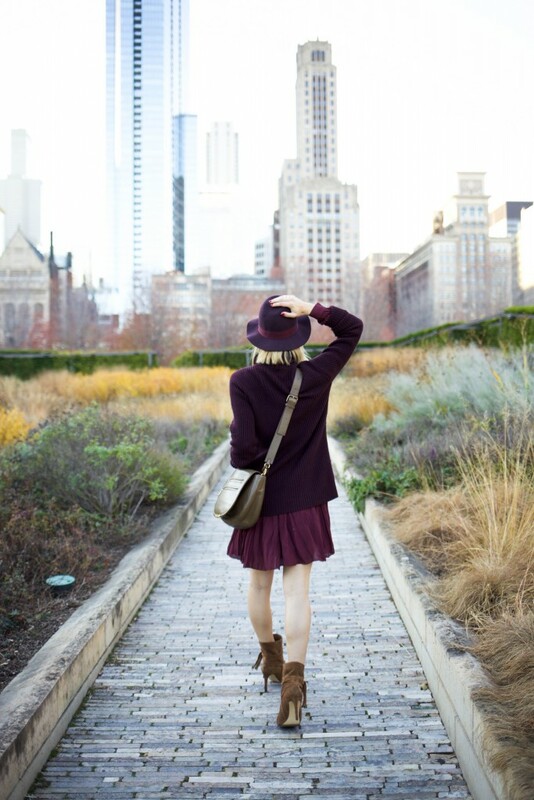 On this occasion, I layered the dress with the perfect burgundy turtleneck sweater from Nordstrom – I’m a sucker for a good monochromatic look and I love the statement it can make. 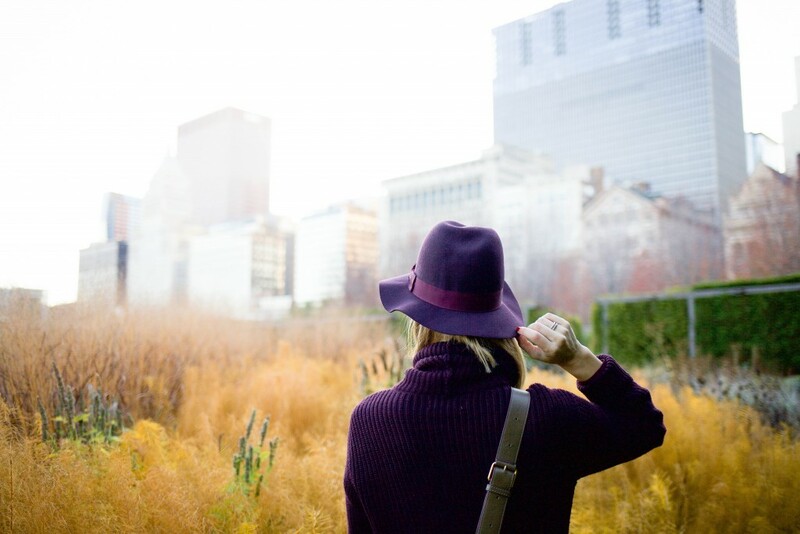 To keep my monochromatic game strong, I paired the look with a burgundy wool hat to compliment my fall burgundy hue look. And whats accessorizing if it doesn’t involve these booties – score them on Ann Taylor today for 40%!! To see some other brunch looks, click here. I absolutely LOVE burgundy! That sweater/dress combo looks perfect, especially with that cute hat! I’m SO checking out Whistles – love learning of new (and must-have) brands/stores! 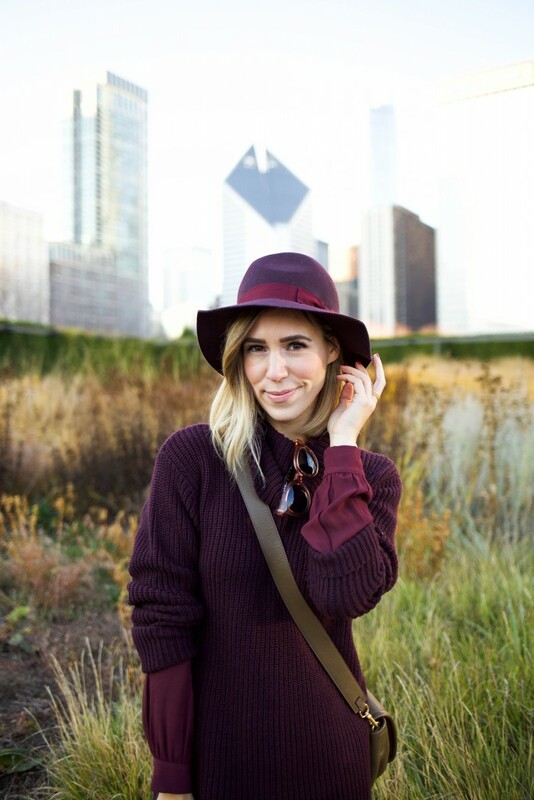 Loving the burgundy look… I need to get more of that color in my closet! I love this outfit! Burgundy is an amazing color. It matches everything! OMG! I love that this is a dress+sweater combo! What a perfect trick! What a great color palette!! I love burgundy and your pops of light brown/beige are the perfect compliment. Very pretty! Thank you for sharing and have a wonderful weekend! I absolutely LOVE that you paired burgundy with burgundy! It’s fall perfection!! Absolutely beautiful! Your style is always so on point. Hope your week is off to a great start lovely lady!! OKAY. Girl you wore this look perfectly! I love that you wore burgundy and burgundy together! Amazing look! Absolutely fabulous! I love burgundy on you, just gorgeous. I just want to tell you that I am all new to blogging and seriously loved this web site. Most likely I’m planning to bookmark your blog post . You really come with remarkable posts. Cheers for revealing your blog. Hey there. I found your site by way of Google even as searching for a related topic, your website came up. It seems good. I have bookmarked it in my google bookmarks to visit then. Hey there. I found your blog by the use of Google at the same time as searching for a related subject, your website came up. It appears great. I’ve bookmarked it in my google bookmarks to visit then. Hello there. I found your web site by means of Google while searching for a similar topic, your website got here up. It appears to be good. I’ve bookmarked it in my google bookmarks to come back then. Hiya, I am really glad I’ve found this info. Nowadays bloggers publish just about gossip and net stuff and this is actually frustrating. A good website with exciting content, that is what I need. Thanks for making this site, and I’ll be visiting again. Do you do newsletters by email? Hello there. I found your website via Google whilst searching for a related topic, your web site got here up. It seems good. I’ve bookmarked it in my google bookmarks to visit then. Hiya, I’m really glad I’ve found this info. Today bloggers publish just about gossip and net stuff and this is actually frustrating. A good web site with interesting content, that is what I need. Thank you for making this site, and I’ll be visiting again. Do you do newsletters by email? Hi there. I discovered your website by means of Google while searching for a related subject, your website got here up. It looks good. I have bookmarked it in my google bookmarks to come back then. Hiya, I am really glad I’ve found this info. Today bloggers publish only about gossip and internet stuff and this is actually annoying. A good blog with exciting content, this is what I need. Thanks for making this website, and I’ll be visiting again. Do you do newsletters by email? Hiya, I’m really glad I have found this info. Today bloggers publish only about gossip and net stuff and this is really annoying. A good web site with interesting content, this is what I need. Thanks for making this web site, and I’ll be visiting again. Do you do newsletters by email? Hi there. I discovered your website by the use of Google whilst searching for a comparable matter, your site came up. It looks good. I have bookmarked it in my google bookmarks to come back then. Hello there. I discovered your site by the use of Google whilst looking for a related matter, your website got here up. It appears to be great. I’ve bookmarked it in my google bookmarks to come back then. Hiya, I am really glad I have found this information. Nowadays bloggers publish just about gossip and web stuff and this is actually annoying. A good web site with interesting content, that’s what I need. Thank you for making this website, and I’ll be visiting again. Do you do newsletters by email? Hello there. I found your blog by the use of Google even as looking for a related subject, your web site came up. It looks great. I have bookmarked it in my google bookmarks to come back then. Hi there. I found your blog by the use of Google while looking for a comparable matter, your site came up. It appears to be great. I’ve bookmarked it in my google bookmarks to visit then. Hello there. I discovered your web site by way of Google at the same time as searching for a similar matter, your site came up. It seems good. I have bookmarked it in my google bookmarks to visit then. Hey there. I discovered your blog by the use of Google at the same time as searching for a comparable topic, your site got here up. It seems good. I have bookmarked it in my google bookmarks to visit then. Hi there. I discovered your blog by means of Google at the same time as looking for a similar topic, your site came up. It appears great. I’ve bookmarked it in my google bookmarks to visit then. Hello there. I found your website by the use of Google at the same time as looking for a related topic, your web site came up. It appears good. I have bookmarked it in my google bookmarks to come back then. Hey there. I found your blog via Google even as looking for a comparable topic, your web site came up. It looks great. I have bookmarked it in my google bookmarks to come back then. Hey there. I discovered your blog by way of Google whilst looking for a related topic, your web site came up. It appears to be good. I’ve bookmarked it in my google bookmarks to come back then. Hey there. I discovered your web site by way of Google even as searching for a comparable matter, your web site came up. It looks good. I have bookmarked it in my google bookmarks to come back then. Hi there. I found your web site by means of Google while looking for a similar matter, your website came up. It looks good. I have bookmarked it in my google bookmarks to come back then. Hello there. I found your site by means of Google while looking for a similar topic, your web site came up. It looks good. I’ve bookmarked it in my google bookmarks to visit then. Hey there. I found your site by the use of Google while looking for a similar subject, your site got here up. It appears good. I’ve bookmarked it in my google bookmarks to visit then. Hi there. I discovered your website by the use of Google while searching for a comparable topic, your web site got here up. It appears good. I’ve bookmarked it in my google bookmarks to come back then. Hello there. I discovered your site by the use of Google at the same time as looking for a comparable topic, your site came up. It appears good. I have bookmarked it in my google bookmarks to visit then. Hey there. I discovered your web site by the use of Google at the same time as looking for a comparable topic, your web site got here up. It appears to be good. I’ve bookmarked it in my google bookmarks to visit then. Hiya, I’m really glad I have found this info. Nowadays bloggers publish only about gossip and net stuff and this is really irritating. A good blog with interesting content, this is what I need. Thanks for making this site, and I will be visiting again. Do you do newsletters by email? Hi there. I found your site by the use of Google even as searching for a related subject, your site came up. It appears great. I have bookmarked it in my google bookmarks to visit then. Hello there. I found your website by way of Google whilst searching for a similar subject, your web site came up. It appears to be good. I’ve bookmarked it in my google bookmarks to visit then. Hiya, I’m really glad I have found this information. Today bloggers publish only about gossip and web stuff and this is really frustrating. A good website with exciting content, that is what I need. Thanks for making this website, and I’ll be visiting again. Do you do newsletters by email? Hiya, I am really glad I’ve found this info. Nowadays bloggers publish just about gossip and internet stuff and this is actually annoying. A good blog with exciting content, this is what I need. Thank you for making this web site, and I will be visiting again. Do you do newsletters by email? Hi there. I found your site via Google whilst looking for a comparable topic, your website came up. It appears great. I have bookmarked it in my google bookmarks to come back then. Hi there. I found your website by means of Google at the same time as searching for a related matter, your web site got here up. It appears good. I’ve bookmarked it in my google bookmarks to visit then. Hiya, I am really glad I have found this info. Today bloggers publish only about gossip and internet stuff and this is really frustrating. A good web site with exciting content, that’s what I need. Thank you for making this web site, and I’ll be visiting again. Do you do newsletters by email? Hiya, I am really glad I have found this info. Today bloggers publish only about gossip and internet stuff and this is really frustrating. A good website with exciting content, that’s what I need. Thank you for making this web-site, and I’ll be visiting again. Do you do newsletters by email? Hello there. I found your web site by way of Google whilst searching for a comparable subject, your website came up. It appears good. I have bookmarked it in my google bookmarks to visit then. Hello there. I found your site by way of Google whilst looking for a similar topic, your web site came up. It seems to be good. I’ve bookmarked it in my google bookmarks to visit then. Hi there. I discovered your web site by way of Google even as searching for a similar subject, your site came up. It looks great. I have bookmarked it in my google bookmarks to come back then. Hey there. I found your web site by the use of Google whilst searching for a similar topic, your web site got here up. It appears to be good. I’ve bookmarked it in my google bookmarks to come back then. Hi there. I found your site by the use of Google at the same time as searching for a similar matter, your site came up. It seems to be great. I’ve bookmarked it in my google bookmarks to visit then. Hi there. I found your blog via Google even as searching for a similar subject, your site came up. It seems to be good. I have bookmarked it in my google bookmarks to visit then. Hey there. I discovered your website by way of Google whilst looking for a related topic, your site came up. It appears to be great. I have bookmarked it in my google bookmarks to visit then. Hi there. I found your site via Google whilst searching for a related subject, your web site came up. It looks good. I have bookmarked it in my google bookmarks to visit then. Hello there. I found your web site by means of Google whilst searching for a related topic, your website got here up. It seems to be great. I’ve bookmarked it in my google bookmarks to come back then. Hi there. I discovered your web site by way of Google while searching for a comparable matter, your web site came up. It looks great. I have bookmarked it in my google bookmarks to come back then. Hey there. I found your site via Google while searching for a comparable matter, your site got here up. It appears great. I’ve bookmarked it in my google bookmarks to visit then. Hey there. I found your site via Google while searching for a related topic, your web site came up. It seems good. I have bookmarked it in my google bookmarks to come back then. Hi there. I discovered your site by the use of Google while looking for a comparable subject, your web site came up. It appears to be great. I have bookmarked it in my google bookmarks to come back then. Hey there. I found your blog by the use of Google while looking for a related matter, your web site came up. It looks good. I have bookmarked it in my google bookmarks to visit then. Hey there. I discovered your website by means of Google even as searching for a similar subject, your web site came up. It appears great. I have bookmarked it in my google bookmarks to come back then. Hello there. I discovered your website by the use of Google whilst looking for a comparable matter, your site got here up. It seems to be great. I have bookmarked it in my google bookmarks to come back then. Hiya, I’m really glad I have found this information. Nowadays bloggers publish only about gossip and net stuff and this is actually annoying. A good blog with exciting content, that is what I need. Thank you for making this web site, and I’ll be visiting again. Do you do newsletters by email? Hi there. I found your web site by means of Google even as searching for a related topic, your web site got here up. It appears great. I have bookmarked it in my google bookmarks to visit then. Hello there. I discovered your site by way of Google even as searching for a similar subject, your website got here up. It appears great. I’ve bookmarked it in my google bookmarks to come back then. Hi there. I discovered your blog via Google while searching for a related subject, your web site came up. It looks great. I’ve bookmarked it in my google bookmarks to visit then. Hey there. I found your web site by means of Google whilst looking for a related matter, your web site came up. It seems great. I have bookmarked it in my google bookmarks to come back then. Hi there. I discovered your web site by way of Google while searching for a related matter, your web site got here up. It appears to be great. I have bookmarked it in my google bookmarks to come back then. Hiya, I am really glad I have found this information. Nowadays bloggers publish just about gossip and web stuff and this is actually annoying. A good web site with interesting content, that is what I need. Thank you for making this website, and I’ll be visiting again. Do you do newsletters by email? Hello there. I discovered your site by way of Google whilst looking for a comparable topic, your web site came up. It looks great. I have bookmarked it in my google bookmarks to come back then. Hi there. I discovered your website via Google while looking for a related topic, your web site got here up. It appears to be good. I’ve bookmarked it in my google bookmarks to visit then. Hello there. I found your web site by the use of Google at the same time as searching for a similar topic, your web site got here up. It seems good. I have bookmarked it in my google bookmarks to visit then. Hello there. I discovered your blog via Google at the same time as looking for a comparable matter, your site came up. It seems great. I’ve bookmarked it in my google bookmarks to come back then. Hello there. I found your site by means of Google at the same time as searching for a related subject, your web site came up. It seems good. I’ve bookmarked it in my google bookmarks to come back then. Hey there. I found your website by way of Google even as looking for a comparable topic, your site came up. It appears great. I have bookmarked it in my google bookmarks to visit then. Hiya, I am really glad I have found this information. Today bloggers publish only about gossip and net stuff and this is really frustrating. A good web site with interesting content, that is what I need. Thanks for making this website, and I’ll be visiting again. Do you do newsletters by email? Hey there. I discovered your site by means of Google whilst looking for a related matter, your site came up. It appears to be good. I have bookmarked it in my google bookmarks to come back then. Hey there. I discovered your blog by way of Google while searching for a comparable subject, your web site got here up. It seems good. I have bookmarked it in my google bookmarks to visit then. Hi there. I discovered your blog via Google at the same time as looking for a related subject, your site came up. It looks great. I have bookmarked it in my google bookmarks to come back then. Hello there. I found your site by the use of Google while looking for a related matter, your website got here up. It seems to be great. I have bookmarked it in my google bookmarks to visit then. Hi there. I found your site by means of Google while searching for a comparable matter, your website came up. It seems to be great. I’ve bookmarked it in my google bookmarks to visit then. Hey there. I found your web site via Google even as searching for a similar matter, your site came up. It appears to be great. I have bookmarked it in my google bookmarks to visit then. Hello there. I found your blog by means of Google whilst searching for a comparable topic, your website came up. It seems great. I have bookmarked it in my google bookmarks to visit then. Hiya, I’m really glad I’ve found this information. Nowadays bloggers publish only about gossip and net stuff and this is really frustrating. A good site with exciting content, that is what I need. Thanks for making this website, and I’ll be visiting again. Do you do newsletters by email? Hi there. I found your site by way of Google while looking for a comparable matter, your site got here up. It appears good. I’ve bookmarked it in my google bookmarks to visit then. Hello there. I discovered your web site via Google at the same time as searching for a comparable matter, your site got here up. It looks good. I have bookmarked it in my google bookmarks to come back then. Hello there. I discovered your blog by means of Google at the same time as searching for a comparable matter, your website came up. It appears good. I’ve bookmarked it in my google bookmarks to visit then. Hiya, I’m really glad I’ve found this information. Today bloggers publish just about gossip and internet stuff and this is really frustrating. A good blog with interesting content, that’s what I need. Thank you for making this web site, and I’ll be visiting again. Do you do newsletters by email? Hiya, I’m really glad I’ve found this information. Today bloggers publish only about gossip and internet stuff and this is really frustrating. A good web site with exciting content, that is what I need. Thanks for making this web-site, and I will be visiting again. Do you do newsletters by email? Hiya, I am really glad I’ve found this info. Nowadays bloggers publish only about gossip and internet stuff and this is really irritating. A good web site with exciting content, that’s what I need. Thank you for making this web-site, and I will be visiting again. Do you do newsletters by email? Hello there. I discovered your website by way of Google at the same time as searching for a similar subject, your site got here up. It appears to be great. I’ve bookmarked it in my google bookmarks to visit then. Hiya, I am really glad I have found this info. Today bloggers publish only about gossip and internet stuff and this is really frustrating. A good website with exciting content, that’s what I need. Thanks for making this web-site, and I will be visiting again. Do you do newsletters by email? Hiya, I am really glad I’ve found this info. Today bloggers publish only about gossip and net stuff and this is actually frustrating. A good web site with exciting content, this is what I need. Thanks for making this site, and I’ll be visiting again. Do you do newsletters by email? Hi there. I discovered your site by means of Google whilst searching for a similar matter, your site got here up. It seems to be great. I’ve bookmarked it in my google bookmarks to visit then. Hello there. I discovered your website by means of Google while searching for a comparable matter, your website got here up. It looks good. I’ve bookmarked it in my google bookmarks to visit then. Hi there. I discovered your site by the use of Google whilst searching for a related subject, your web site came up. It seems good. I’ve bookmarked it in my google bookmarks to come back then. Hi there. I discovered your site via Google while searching for a related subject, your site came up. It appears to be great. I have bookmarked it in my google bookmarks to come back then. Hey there. I discovered your website by way of Google whilst looking for a related subject, your web site came up. It appears great. I’ve bookmarked it in my google bookmarks to come back then. Hiya, I am really glad I have found this info. Today bloggers publish just about gossip and internet stuff and this is actually irritating. A good web site with exciting content, that’s what I need. Thank you for making this web site, and I’ll be visiting again. Do you do newsletters by email? Hiya, I’m really glad I’ve found this info. Today bloggers publish just about gossip and internet stuff and this is actually irritating. A good blog with interesting content, this is what I need. Thank you for making this web-site, and I will be visiting again. Do you do newsletters by email? Hey there. I discovered your web site by the use of Google at the same time as searching for a related topic, your web site got here up. It seems to be great. I’ve bookmarked it in my google bookmarks to come back then. Hey there. I found your blog by means of Google even as searching for a related topic, your web site came up. It appears great. I have bookmarked it in my google bookmarks to come back then. Hello there. I discovered your web site by means of Google while looking for a comparable matter, your web site got here up. It appears good. I have bookmarked it in my google bookmarks to visit then. Hiya, I am really glad I have found this information. Today bloggers publish only about gossip and internet stuff and this is actually frustrating. A good site with exciting content, that is what I need. Thanks for making this web site, and I’ll be visiting again. Do you do newsletters by email? Hi there. I discovered your website by the use of Google at the same time as looking for a similar subject, your site got here up. It appears good. I’ve bookmarked it in my google bookmarks to visit then. Hello there. I found your website by the use of Google even as searching for a comparable topic, your web site got here up. It seems to be great. I have bookmarked it in my google bookmarks to come back then. Hi there. I discovered your web site by the use of Google at the same time as looking for a similar topic, your web site came up. It looks good. I have bookmarked it in my google bookmarks to come back then. Hey there. I found your site by the use of Google even as searching for a similar matter, your web site came up. It seems to be great. I’ve bookmarked it in my google bookmarks to visit then. Hey there. I found your website via Google while searching for a related subject, your site came up. It appears to be good. I’ve bookmarked it in my google bookmarks to come back then. Hey there. I discovered your blog by means of Google whilst looking for a similar subject, your site got here up. It seems to be good. I have bookmarked it in my google bookmarks to come back then. Hello there. I discovered your web site by way of Google whilst searching for a comparable topic, your site came up. It looks great. I’ve bookmarked it in my google bookmarks to visit then. Hey there. I found your web site by the use of Google while searching for a related topic, your site came up. It seems to be great. I’ve bookmarked it in my google bookmarks to come back then. Hi there. I found your website by way of Google while searching for a similar matter, your website came up. It appears to be great. I’ve bookmarked it in my google bookmarks to visit then. Hey there. I discovered your site by means of Google at the same time as looking for a comparable topic, your site came up. It appears good. I’ve bookmarked it in my google bookmarks to come back then. Hello there. I discovered your blog via Google while searching for a related subject, your site got here up. It appears to be great. I’ve bookmarked it in my google bookmarks to come back then. Hey there. I discovered your website by way of Google even as looking for a comparable subject, your site came up. It looks good. I’ve bookmarked it in my google bookmarks to visit then. Hiya, I’m really glad I’ve found this information. Nowadays bloggers publish only about gossip and internet stuff and this is really irritating. A good web site with exciting content, this is what I need. Thanks for making this site, and I’ll be visiting again. Do you do newsletters by email? Hi there. I discovered your web site by means of Google whilst looking for a related matter, your site came up. It seems to be good. I’ve bookmarked it in my google bookmarks to visit then. Hiya, I’m really glad I have found this information. Nowadays bloggers publish just about gossip and web stuff and this is really irritating. A good web site with exciting content, that is what I need. Thank you for making this web-site, and I’ll be visiting again. Do you do newsletters by email? Hi there. I found your site by the use of Google even as searching for a similar matter, your website came up. It appears to be good. I’ve bookmarked it in my google bookmarks to come back then. Hiya, I am really glad I have found this information. Nowadays bloggers publish just about gossip and internet stuff and this is really irritating. A good website with exciting content, that is what I need. Thanks for making this website, and I’ll be visiting again. Do you do newsletters by email? Hello there. I found your blog via Google while searching for a related matter, your site came up. It looks great. I’ve bookmarked it in my google bookmarks to visit then.